Band-Aid approaches or one-off seminars. It is about a complete strategy for leadership and culture transformation. Our clients have achieved extraordinary results because they were willing to do the work necessary to get there, kept an open mind, and made the tough choices along the way. And, they were willing to take extreme ownership of their success. As a result, we've helped them build workplaces where people – and the bottom-line – thrive. over a three-year period compared to S&P 500 companies. which only achieved a 15% revenue growth rate during that same period. "WE GREW 63% IN ONE YEAR, ADDING OVER $1 MILLION TO OUR BOTTOM-LINE." I remember it like it was yesterday. The dopamine hit of discovery as I realized I didn’t have to mimic the businesses around me, even the ones I deeply admired. We were struggling. We had a structure we thought followed best practice: myself as CEO, a General Manager leading operations and functional heads for the key areas. But it never worked. The team were disempowered, even infantilized. My epiphany came when I looked honestly at the WorldBlu democratic principle of decentralization. I realized decision-making should happen as close as possible to the work or the data. I proposed a new leadership structure: a team of equals, serving the business. A year later and the leadership team is knocking it out of the park; they’re aligned, committed and accountable. 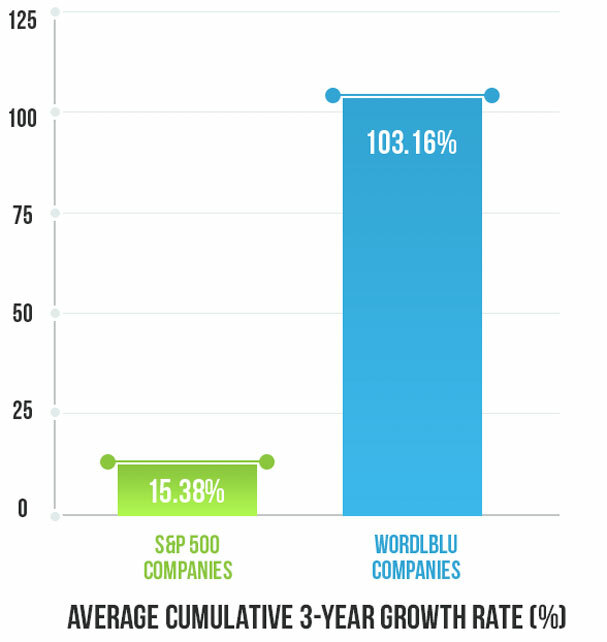 And WorldBlu has delivered benefits directly to our bottom-line, with revenue DOUBLING in just one year. When we started DreamHost in 1997 we knew immediately that the traditional top-down style of management wasn’t going to work for us - we wanted to give our team a voice and a say in the direction of the company. We had created a Freedom-Centered Workplace before we even realized there was a name for it . . .
Those values carried through to our founding of spinoff company, called Inktank, in 2012. We infused WorldBlu’s principles into our shared thoughts on leadership, organizational design, and employee participation from the very beginning, and it paid off in a big way! Just two years after its inception, Inktank was purchased by Red Hat for $175 million. We saw first-hand that a culture built on trust, freedom, and a shared vision can have incredible value, and so did the 200 people who benefited financially from the sale! Those values carried through to our founding of spinoff company, called Inktank, in 2012. We infused WorldBlu’s principles into our shared thoughts on leadership, organizational design, and employee participation from the very beginning, and it paid off in a big way! Just two years after its inception, Inktank was purchased by Red Hat for $175 million. We saw first-hand that a culture built on trust, freedom, and a shared vision can have incredible value, and so did the 200 people who benefited financially from the sale! "WE GREW 12X WITH A 26% AVERAGE GROWTH RATE FOR THE PAST THREE YEARS." 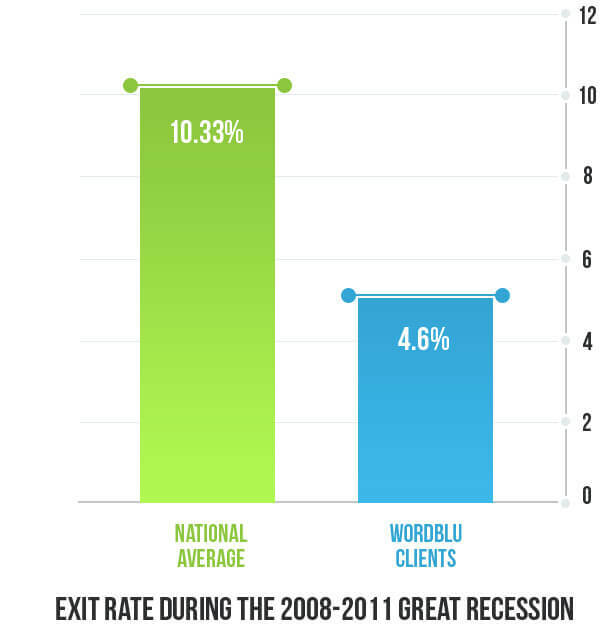 We've been a part of the WorldBlu community since 2009. And with WorldBlu’s help, we've grown more than 12 times since then. Our growth and success is a direct result of our culture, which is guided by the freedom-centered and democratic principles that WorldBlu represents. "OUR SALES HAVE QUADRUPLED AND OUR MARKET CAP HAS INCREASED FROM $250 MILLION TO OVER $2 BILLION DOLLARS." At WD-40 Company, we consider our people to be one of our most valuable assets. Many years ago, we set out to create and sustain a culture that would consistently promote meaningful work life in the organization. We respect each other as people first, and strive to include the consideration of the entire “tribe” of WD-40 Company employees in everything we do. We believe that by practicing inclusiveness in decision-making and empowering individuals to control as much of their work methods and priorities as practical and possible, we create a culture of engaged and passionate employees. Third party research has shown that companies with strong cultures and higher engagement levels enjoy better returns and stronger growth. As a publicly-traded company, strong returns help ensure that we can maintain our strategic course and strength of culture, while fulfilling our responsibilities to shareholders. "Creating a freedom-based environment is essential." Do You Want These Results For Your Organization? If yes, then watch our complimentary 45-minute training and then book a call with us.